Whether of the first or last minute variety, one thing is clear when you hit the city streets: everyone is shopping. I enjoy finding gifts for loved ones and am not so bothered by the financial fête that Christmas ultimately is, but as an agorophobe at heart, the hoards of shoppers that one must contend with in order to make a purchase is something I start to resent at this time of year. Paris is a crowded city and after doing your prefunctory to work from home and back again trip, it's hard to get the energy to ride the metro yuletidal wave in order to go shopping. However, Paris is also a great city to explore and an even better place to make discoveries. In my organic, local shopping spree, I've found and been lead to some off- the-beaten track places where I've found gifts and solace from the consuming masses. Here are a couple of these bonnes adresses and what I bought there. You can hardly hit a marché in France without running into an apiculturist selling homemade honey. France has a booming apiculture, in which Paris takes part. I've heard that Paris actually makes a sizable amount of honey sold in France, but you'll have to fact check that, as it is not obvious where all this honey is made. The beehives at the Luxembourg Garden are visable to a garden wanderer, but the enigme of how to taste their honey is a troubling one. I happened to pass through the garden in late October and saw a hand written sign that announced a sale of Luxembourg honey had taken place the weekend before and I immediately promised myself I'd keep my eyes peeled next October to take advantage of the opportunity. 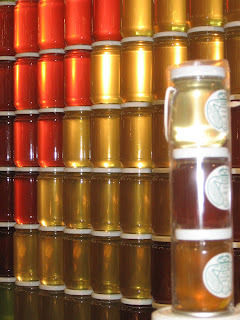 However, October is a long way away and that is why I was thrilled to find David Lebovitz's blog entry on the UNAF which sells honey made in Paris, at the Ecole Vétérinaire d'Alfort. Located on a side street of the Marais, this location is home to the Union of French Apiculturists and distributes literature on honey and honey making as well as the finished product itself. For 7 euro you can take home a jar of Parisian honey. It doesn't get more local than that, which makes this a nice gift for both Parisians and Francophiles abroad. My Monsieur has been doing the aller-retour from this artisinal beer and bubbly store all season. He has become a pretty popular Secret Santa with his well appreciated beers from France and abroad. The Cave à Bulles disproves anyone who asserts that the French can't make good beer, with delightfully drinkable microbrews hailing from Normandy and Brittany serving as examples to the contrary. Another selling point of this beer boutique is that it is the only store in the city (and one fo few in France) that sells my most favorite Belgian beer, Cantillon. This spontaneously fermented beer from Brussels is habit forming, so all you addicts can rest assured that you can get your fix on rue Quincampoix. Take some home for you and stuff whatever is left in someone's stocking, you can't go wrong with organic booze, don't even bother fact checking that. This store has served as a seed seller since 1895 and, as the name indicates, has been passed down from father to son since then. While they still sell an excellent selection of seeds from herbs, fruits, veggies, and flowers, you can also find a wide assortement of dried and artisinal goods. I always stop into this under-crowded store around Christmas time because they have a huge selection of easy to ship and sure to please regional products. They also sell products for the home and garden, like charming planter pots and tomato vine scented candles that transport you to Summertime. Check out their kits à cuisiner which are cellophane bags containing all the ingredients to make savory dishes like rice pilaf and mushroom risotto or sweet servings of riz au lait and muffins. I hope this spots can help you side step the crowds and find what you're looking for for the last of your list. I'm done gift guiding for this year, so I wish you all the best and Happy Holidays to you and yours!